Our favourite time of the year is here :D Diwali dinners and parties have begun. And festivities always call for bright colours and vintage jewelry. 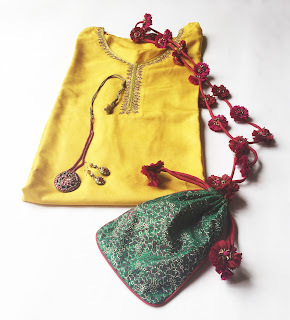 I chose to wear this yellow kurta paired with this Pure Ghee brocade sling. It's actually a smartphone sling which doubles up as a potli to keep your essentials. The dainty silk flowers add the festive touch while keeping me hands free. 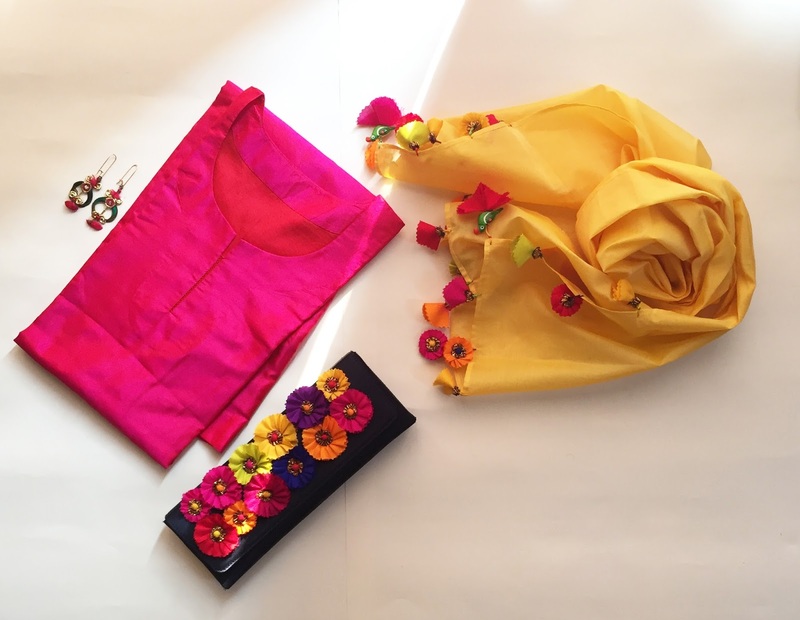 If a saree is too much of a hassle for you, pick out a lovely versatile kurta. 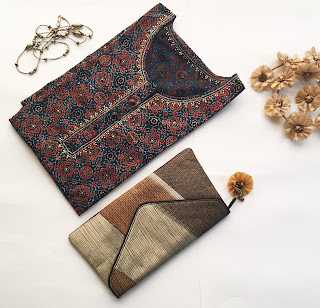 I wore this Ajrakh kurta with a crinkled skirt to add to the festive vibe and give the salwars a break. I completed the look with a Pure Ghee gold gajra, my go-to accessory, and a one of a kind patch work clutch, again from Pure Ghee. Nothing beats the beauty of a traditional Indian handwork. 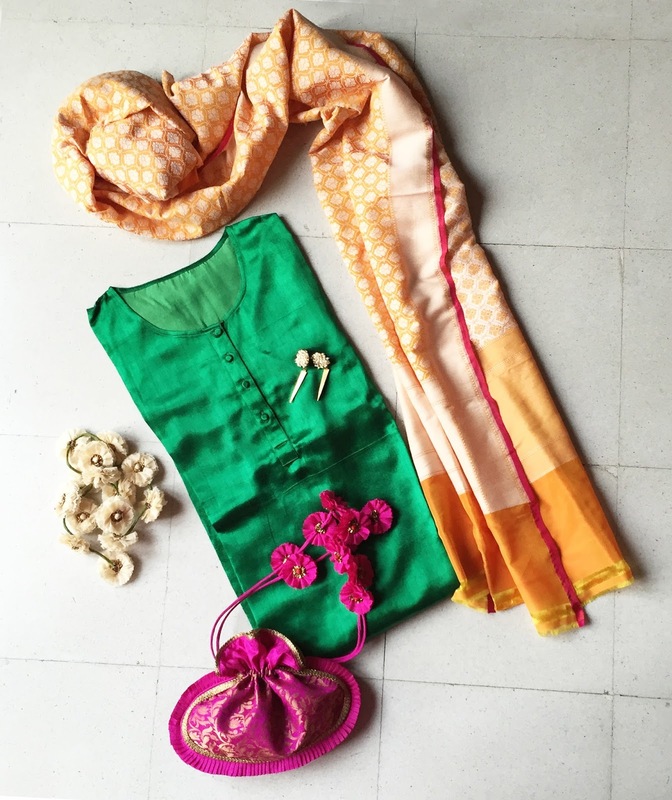 If you're not one for heavy suits and sarees, pick out a simple embroidered piece. I wore this beautiful white Kurta with traditional Kashmiri tilla embroidery paired with a bright pink salwar. No more dressing up required ! Just my favourite gold Pure Ghee gajra and gajra potli and simple gold earrings. And like they say, simplicity is the ultimate sophistication. Find a similar Pure Ghee Potli here. This green mashru silk kurta is perfect for how unpredictable the weather has become now. 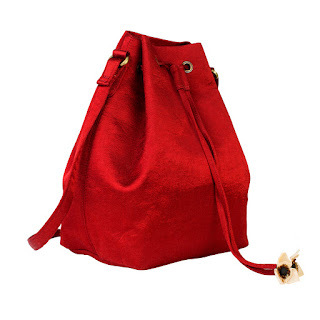 And while it's simple, the color is so beautiful and festive. I'm going to pair this with a yellow and ivory Benarasi dupatta and glam it up with a fucshia Pure Ghee Potli and a string of Pure Ghee ivory gajra. Let's not be matchy matchy! Let's have fun with colours! Gujarat is home to some brilliant weaves. 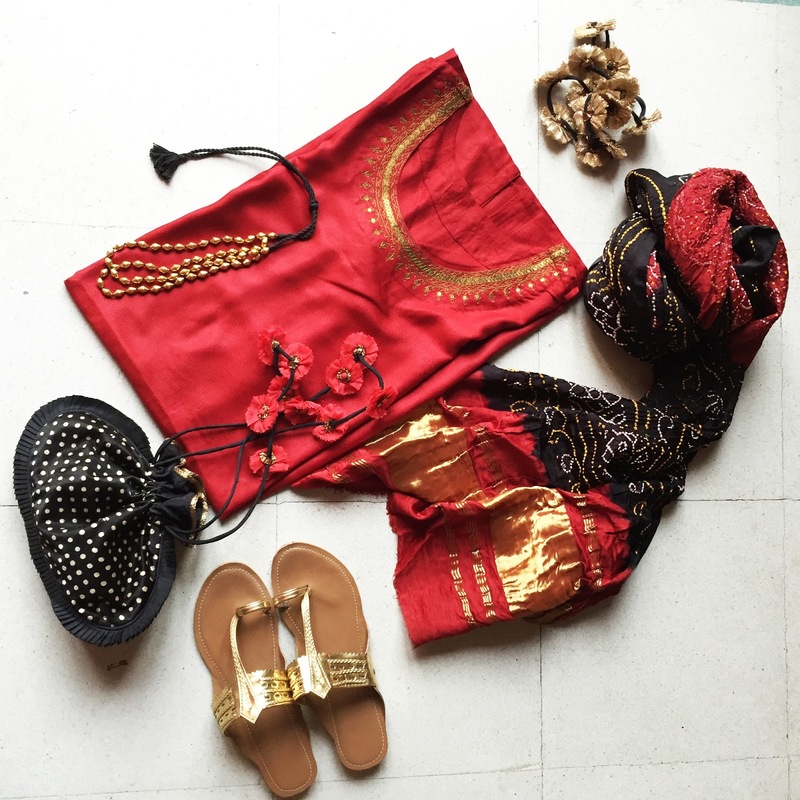 One among this state’s textile offerings is the beautiful Mashru. It is believed this weave stemmed out of the rule of Muslim men not being allowed to wear silk. Mashru is made by interlacing silk and cotton yarns. Each silk yarn, which is used as the warp goes under one and above at least 5-8 or more cotton yarns thus making cotton the underside of the fabric and the top a shiny silk. Since the silk doesn’t touch the skin, the men were allowed to wear it. Mashru in Arabic means permitted and hence the name. 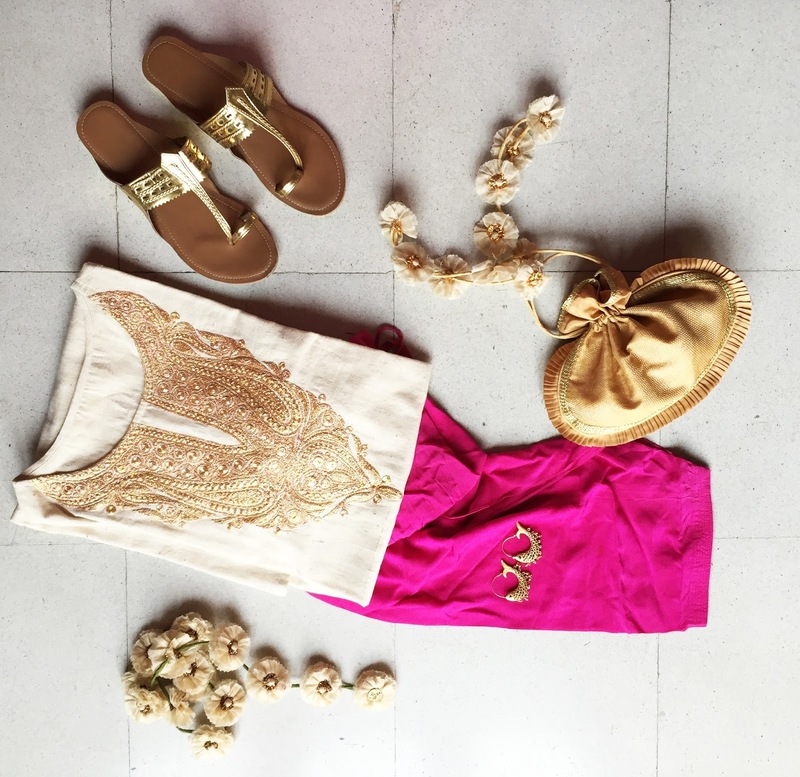 Definitely everyone’s top pick when it comes to festive wear. While weaving regular cloth involves a weft holding the warp threads together, Brocade has a supplementary weft along with the standard one to give that ornate look. That extra weft makes it look like the cloth is embroidered when it actually isn’t. Brocade is made on a draw loom with perforated cards that guide the design. And with the perfect hand-leg coordination on the loom you get an exquisite, elegant brocade. 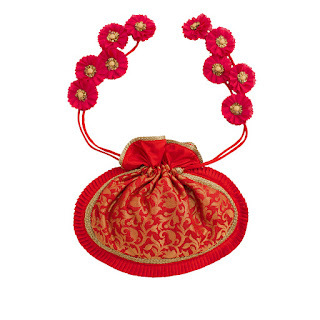 Our best-selling potlis, ideal for the festive season are made with brocade sourced from Benaras. Cherish those Ikat pieces you own, for there is a lot of hard work involved. What distinguishes Ikat is the dyeing of patterns with an elaborate resist dyeing process before the weaving is done. Bundles of warp threads are put on a frame following which, bindings to resist dye penetration are put on parts of the thread that form the motif. The threads are then carefully taken off, dyed, bindings taken off and then reframed. The process continues till you have the desired pattern and the threads are then put on a loom to weave. And that’s how you get an Ikat piece bathed in colorful patterns. India has great diversity of Ikat weaving and the best comes from Andhra Pradesh, Gujarat and Orissa. 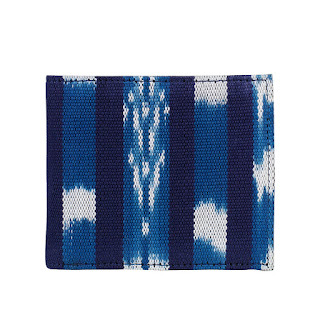 This Pure Ghee wallet is made of heavy Ikat cotton sourced from AP. Simple, so Indian and so stylish! Aditi Prakash has lived and worked in Hyderabad, Ahmedabad and Delhi - cities that have a rich history and syncretic culture. She loves things hand made and is constantly exploring ways to make space for crafts in our modern lives.